This is a self-portrait composite. This image is a focus stack consisting of 6 images for the landscape and sky, with the far focus distance for the sky and mountains being blended in during focus stacking. The 7th image is of the person reaching through the frame for the guitar. The location for this shoot was at Black Rock Desert, NV during a TMCC photography course field trip back in April 2015. Thanks, Pedro for firing the shutter! Thanks to Dean Burton, and the faculty at TMCC for taking the photography classes on this field trip, this image would not exist otherwise. This is a self-portrait composite. This image is a focus stack consisting of 6 images for the landscape and sky, with the far focus distance for the sky and mountains being blended in during focus stacking. 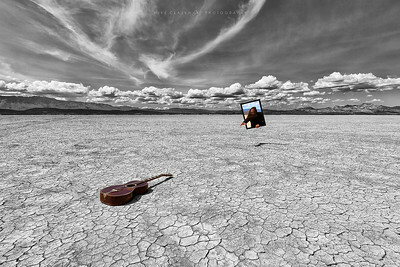 The 7th image is of the person reaching through the frame for the guitar. The location for this shoot was at Black Rock Desert, NV during a TMCC photography course field trip back in April 2015. Thanks, Pedro for firing the shutter! Thanks to Dean Burton, and the faculty at TMCC for taking the photography classes on this field trip, this image would not exist otherwise.